The living room is the place where we spend the majority of the time and wish to have a quality time with our family and friends. Due to this reason, we can’t afford to have any compromise over the décor of the living room; each minute detail should be perfect and accurate, even the ceiling. The question arises: why even the ceiling? The reason behind this is that you have the first view of room ceiling when you lean back to relax on the bed. Nobody wants to have an unpleasant ceiling as it will deteriorate your mood, along with spoiling the beautiful outlook of the room as well. We will shed light at some of the ideas for room ceiling necessary for making your room appear graceful. A striking chandelier can turn out to be a game changing element in terms of the decoration and appearance of your room. It can transform a boring ceiling into an elegant piece, compelling your guests to praise you for making such a creative selection! You should wisely make the chandelier selection by considering the room size, established theme, and the embellishment of the rest of the room. Modern crystal chandeliers- one which has a dangling crystal like segments- are in fashion these days, which present a feeling of openness and liveliness. On the other hand, chandeliers equipped with fade, yellow lights gives the dull appearance to the room- truly depicting the ancient themes like the one that of Mughal era. Chandeliers look stunning. One should give them a try! The faux ceiling is another crucial element for the living room renovation and uplifting its interior look. These also serve the purpose of installing recessed lights; the rays of soft light splashing from the ceiling panels create a soothing atmosphere. Obviously, you have to be vigilant and have the art of selecting matching colors such that the blend of their composition looks stunning. For further enhancement, one has also the option to apply several layers of fake ceiling, stacked on each other, to add charismatic vibe to the room. Ceiling designs allow one to play around with the colors. People generally opt for commonly used or bright colors for ceilings of their living room. Having said that, a variety of color combinations is available to add breathtaking touch to your ceiling i.e. white and red, yellow and white, orange and creamy yellow. 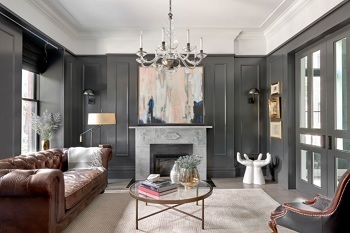 You have to be wise while selecting appropriate color combination to ensure that the chosen contrast suits with the existing theme and color plot of the room. If confusion prevails, you can avail the services of a professional designer to select the best color scheme for your living room ceiling. Model-Home Makeover offered living room renovation ideas that you can consider for making an excellent decoration for your home. The addition of geometrical shapes in the false ceiling is another unique idea. 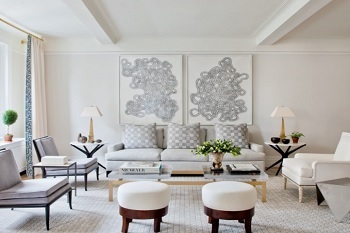 The selection of particular geometrical shapes allows establishing either modern or typical theme for the room. If bold enough, you can also engrave the geometrical shape in your original ceiling for better and genuine feeling. However, one should abstain from it as it can affect the roof strength. Again you can take the help of lights with this design idea to enhance the ceiling. You can install the hidden lights in the geometrical figures to give an illusion of glowing shapes or focus the beam lights on the ceiling to accentuate the details. Instead of throwing away, the removed material can be painted with another contrasting color and placed around the room as a decorating material. Moving ahead of the ceiling, renovate the rest of the room by maintaining the original theme and color contrast. For instance, the furniture, rugs, cushions, bed sheets, and decorating pieces can be chosen for the similar or contrast color to give an elegant look. The living room is an essential part of every home. Since it is the place for family and friends gatherings, living room portrays your personality and your affinity for art and innovation. Therefore, one should particularly pay attention to the condition and décor of the living room. That doesn’t mean you have to fancy and spend a lot of money on its renovation. Simply, you have to apply something unique like the above discussed ideas to transform it into an eye-catchy place that is engulfed in soothing ambience.